I know I’ve advocated meat consumption many times before; I’ve talked about the benefits of eating meat (in moderation of course). In many cases I have stated that the human omnivorous diet (comprised of both meats and vegetal matter) requires a balanced intake of nutrients, from which meat shouldn’t not be left out, mainly because it’s the best source of protein we get. But I feel that I’ve never treated this subject with the proper respect it actually deserved, so I’ll fix that right now. If you’re a bodybuilder or a fitness enthusiast you probably know much about what proteins are and what they’re good for. But for those of you who don’t, allow me to explain. Proteins are essential to living organism and humans make no exception. It helps build and repair muscle mass, it serves as a building block for body chemicals (enzymes, hormones etc. ), skin, blood, bones, helps release carbohydrates into the bloodstream and so on. Every single fully functional cell in the human body needs protein in order to function properly. Some tissues (hair and nails) are comprised mostly of protein. So this macronutrient is one of the building blocks of life, it’s a major part of who and what we are and it’s important to have a balanced diet in which to include rich sources of protein. Let’s have a look at these 4 meats that are packed with protein. And there is no better natural source of protein out there that meat. 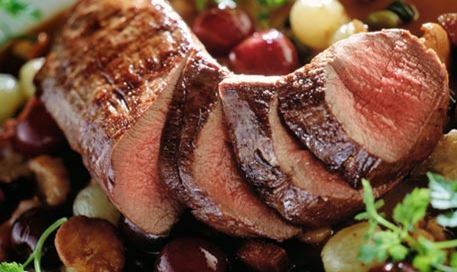 Venison is an excellent source for protein, even better than the common beef. Not only does it have a higher amount of protein/per oz., but it also has a lower count of saturated fats. Protein is only one of the nutritious compounds venison has to offer. It’s packed with iron, riboflavin, vitamin BS and other minerals that are beneficial to human health. It’s pretty versatile when it comes to cooking methods. You can make mouth-watering stakes and stews from back straps, tenderloins or top hams. The neck the belly and the lower ribs can be easily grinded into sausages or stew meat. The best roasts result from the lower hams, but you’ll have to cook them long and slow to tender the meat. Venison has a specific taste, and if you’re not very keen on it, you can marinate it and tinker with the flavor as much as possible. The chicken breast is a common household name that’s known and loved by everybody. We are all familiar with its tenderness and deliciousness. We all know how easy to prepare it is, in how many dishes and recipes we can include it in and how easy it is to procure (found in all types of stores and markets, big or small). But I don’t know how many of us are actually aware of the chicken breast’s nutritious properties. Apart from proteins, it also has phosphorus, magnesium, iron, zinc and also a small amount of calcium. 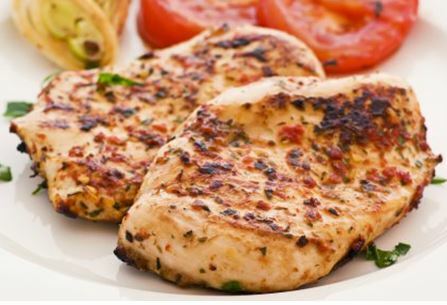 The healthiest approach to eating chicken breast is to serve it grilled, with a side of fresh, steamed or grilled vegetables. But for those of you who don’t mind adding calories to the mix, you can just fry it and eat it with pretty much everything your heart desires. When it comes to cooking chicken breast, the sky’s the limit. This is the best type of beef money can buy. The 95% lean ground beef it’s full of beneficial compounds, such as iron, creatine (that do wonders for your muscles), vitamin B6, vitamin B12, niacin, riboflavin, zinc, calcium and more. The leaner the beef, the better! Ground beef that starts at 90% lean is lower in fatty acids and calories, which makes it perfect as the main pillar of a healthy diet. Cooking it requires some caution and preparation. Because the meat lacks a high amount of fats, it’s advised to use the right amount for cooling oil before frying. If you’re planning a roast, it’s best if you add sauce and cook it slowly, because it’ll need all the moisture it can get. If you already have your heart on switching to this type of meat product, go for grass-fed beef, as it’s tenderer and even richer in protein and nutrients than regular lean beef. 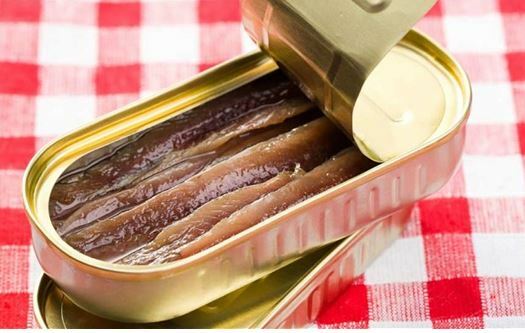 The anchovies are a small breed of fish that are extremely delicious and beneficial at the same time. Apart for being a rich source of protein, they’re also a rich resource of omega 3 fats (beneficial non-saturated fats), vitamin D, vitamin B12, niacin and other nutrients and minerals that make for tough blood vessels, strong bones, and a healthy heart. Their small size also prevents them from accumulating high amounts of toxins, like bigger fish do. Before eating them, soak them in water for about 30 minutes; they retain high amounts of salt and this will remove the excess salt. They’re not meant for cooking (as they tend to dissolve), so just eat them out of the can with greens and cheeses or add them to salad dressings. For a while, I’ve considering pork chops as well. But I ultimately decided to drop them from the list, because of their high amount of fat: 1.2 g of polyunsaturated fat, 3.3 g of saturated fat and 3.9 g of monounsaturated fat. These are some of my personal favorite meats, but I’m sure there are plenty more out there to take into consideration. I’m sure there are plenty of you that could successfully add to this list, and make it go for pages on end. But that is not my goal; all I wanted to do is to share with you the importance and joy of eating meat. Stay safe and healthy!